We're just not all that special. At least that's the consensus from scientists looking at data from a NASA mission to find "habitable" planets out there. The bottom line: one in five sun-like stars may harbor an Earth-like planet. There may be tens of billions of Earth-like planets in our Milky Way Galaxy alone, say astronomers working with data collected by the Kepler telescope. These planets are roughly the same size as Earth and exist at just the right “Goldilocks” temperature that could sustain liquid water and, maybe, life. The closest of these planets is a scant 12 light years away, orbiting a star that's visible to the naked eye. The universe appears to be “crowded” with Earth-like planets, said NASA space scientist Bill Borucki. “If we ever get star travel, we’ll probably see a lot of traffic jams,” he told reporters at a Monday briefing. The profusion of Earth-like planets strongly suggests we aren't alone, says UC Berkeley astronomer and Kepler scientist Geoff Marcy. "The chance for life of some sort out there in the universe has to be essentially 100 percent." Scientists at the Mountain View press briefing said they were struck by the “remarkable” increase in how many of these planets they’ve been able to find. 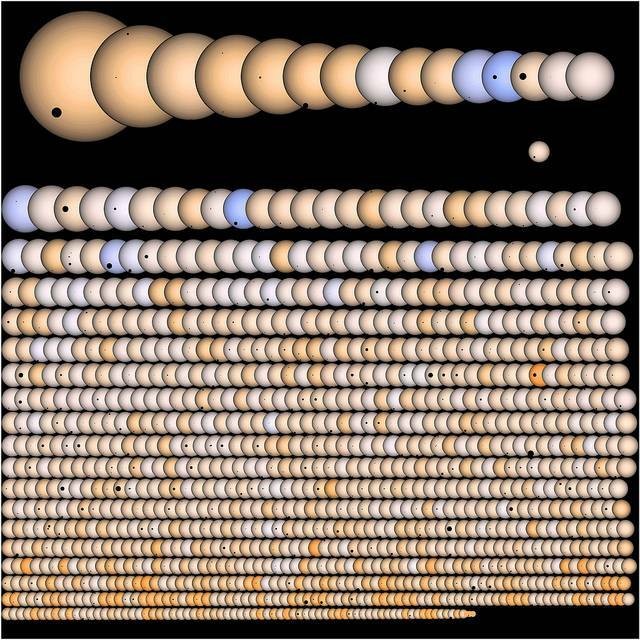 In three years of combing through data collected by the Kepler telescope, scientists have identified 3,538 planets. Of those, 647 are roughly Earth-sized and 104 are in the "habitable zone" where liquid water could flow, potentially giving rise to life. Being in the "habitable zone" doesn't necessarily mean that a planet sustains life, says Marcy. "We can't tell whether they really have oceans and lakes and ponds, the cocktail mixer of biochemistry that makes life possible. We don't know how stable their atmospheres are. So we don't know that the planets that are suitable for life really ever do spawn life." Launched in 2009, the now-crippled Kepler telescope was designed to look for slight fluctuations in the amount of light radiating from distant stars, clues to the whereabouts of potential life-supporting planets. Just as a moth passing in front of a light bulb would create a brief flicker, the same is true of a planet in orbit around a star. Based on those observations, scientists have been able to identify which stars have planets in orbit around them, as well as the size of those planets and how tightly they orbit their stars. Many of these discoveries have been notable more as science fiction curiosities than as potential Edens for intelligent (or non-intelligent) life. Last week, scientists introduced the planet Kepler 78b, which hugs its star at a distance of 900,000 miles -- an orbit of just eight hours, as opposed to Earth’s 360-day cycle. Like Earth, Kepler 78b is rocky and rich in iron, but – at 3,500 degrees Fahrenheit -- a little too toasty for life as we know it. After four years of collecting data, the Kepler telescope hit a disabling technical snag last May. NASA scientists say they’re trying to fix it. But even if the telescope goes dark, the amount of data it collected in its four-year run could provide analytical fodder “indefinitely,” said scientists. For more on the mission, listen to KQED's interview with Kepler astronomer Geoffrey Marcy, of the University of California, Berkeley.